I walk to my working place and I cross a park. Abstracted and lost in my thoughts for a presentation I would have to make that morning about colour I didn’t look to the grounds I was stepping on until a crackling sound broth me to the reality of that November morning. 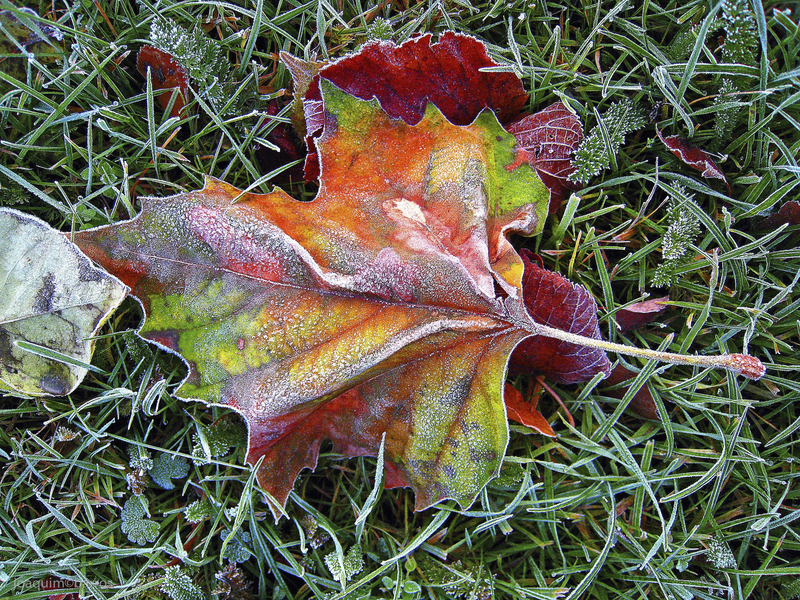 The night has been rather chilly and the early daylight of that morning was discovering frosty grounds with a grass still very green. When I looked down I was walking under a Platanus tree which leaves on the ground were frozen hence the crackling sound that woke me up for the reality of the moment; the reality of the colours impregnated in the leaves and enhanced by the clarity of that early morning. They were like a mosaic on display. After taking a photo of this leaf (I always carry a handy camera with me) I took it to the office and made it a start of my presentation. What better could illustrate the subject I was abou to start; colour gamut.